Bildungsroman is the fancy literary term for a coming-of-age narrative. Usually it’s the focus of a protagonist that is transitioning from youth to adulthood in search of answers by gaining experience from the world. As for conflict, it’s inevitably Character versus Society where the main character slowly is initiated into the values of the society, and after accepting them, he/she is accepted into that society. William Congreve wrote in his play The Morning Bride, “Heaven has no rage like love to hatred turned, Nor hell a fury like a woman scorned.” No, it wasn’t Shakespeare. No story better illustrates this than Stephen King’s first novel Carrie. 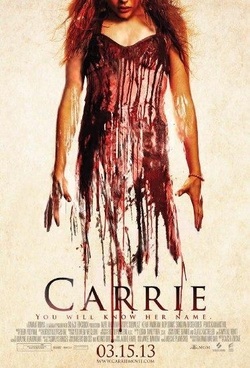 Carrie is a story of passage and coming to understand one’s power. 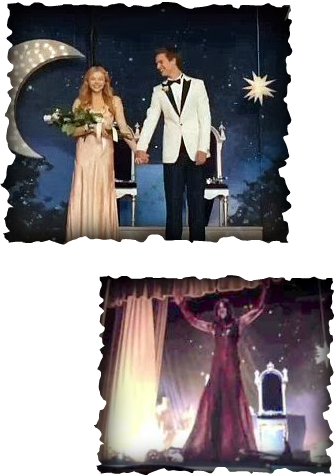 Carrie has to exist in two worlds symbolically represented by Inside her House and at her School. She has to balance the expectations of both worlds and in doing so, in trying to please everyone, she faces conflict. In her Inside world, her mother sees Carrie as a sinner to be punished at the slightest challenge to mother’s authority. The closet in which she is forced for disobedience is a symbolic return to the womb and a state of innocence in Mother’s eyes. It is right before Carrie leaves for the prom that Mother, who has been forbidding Carrie to attend, is forced into the closet. This upsetting of the natural order is illustrated further when Mother attempts escape through a crack in the door symbolize a kind of breech birth. Carrie makes her transition from her initial state where she tells her mother, “I just want you to talk to me,” to her end state when she tells her mother, “I’m going and nothing’s gonna stop me. And I don’t want to talk about it anymore.” Inside the home her period is seen as a cures. The outside world sees it as a normal bodily function. The Inside world sees showering with other girls as a lust filled temptation, the Outside world sees it as “everyone has to shower.” No big deal. But before we begin thinking the Inside world is all radical crazy, it’s Mother who tells Carrie that they will hurt her at the prom; she says, “You’re safe here with me” in the Inside world, but Carrie doesn’t listen. Carrie chooses to accept the values of the Outside world, yet she still has her doubts. Carrie seeks answers from books at first about her newfound powers. She experiments in her room and at school. She is slowly awakening to what she is capable of. As all bildungsroman characters become aware of both their place in society and their power within that society. By accepting society’s rules and values, she should be accepted in, and Carrie is accepted by Tommy, the guy whose girlfriend forces him to ask Carrie to the prom in atonement for being part of a group bullying moment. But ultimately, the society she wants to fit into rejects her at the prom in a visceral, gut wrenching scene involving pig’s blood and a white dress (her name IS Carrie White after all!). It’s an iconic horror movie image form both the Stephen King novel and the De Palma 1976 version of the film. Carrie then goes from “The other kids think I’m weird. I don’t want that. I have to try and be a whole person before it’s too late,” to mass murdering killer in a revenge spree against her high school tormentors. It’s poetic justice and by this point in the film we’re cheering her on. I kind of hate that Tommy bites it, but he’s guilty by association of the IN crowd, I guess. Once Carrie has rejected the values of home and then rejects the values of society, there’s really nowhere else to turn. Thus the implosive ending. Yet, even in her darkest hour, she finds compassion for one of her would-be tormentors, who actually has tried to help. Carrie’s destruction, even self-destruction is justified because we cannot live in a world where people wield this kind of power. The audience needs reassurance that their social values are still validly intact.This leads to the original ending which I saw in the movie theater and the new ending on the Blue-ray version that I watched last night. The new ending was very much a nod to the De Palma version and I liked it better.